We have featured quite a few different home made gaming consoles, mods and even some video game coffee tables, here is a cool one that will appeal to all the retro gaming fans out there, the Super Pong Table. The Super Pong Table was created by Brad, and he has posted full instructions on how he made it over at Instructables, have a look at the video of it in action below. Introducing Super Table Pong. 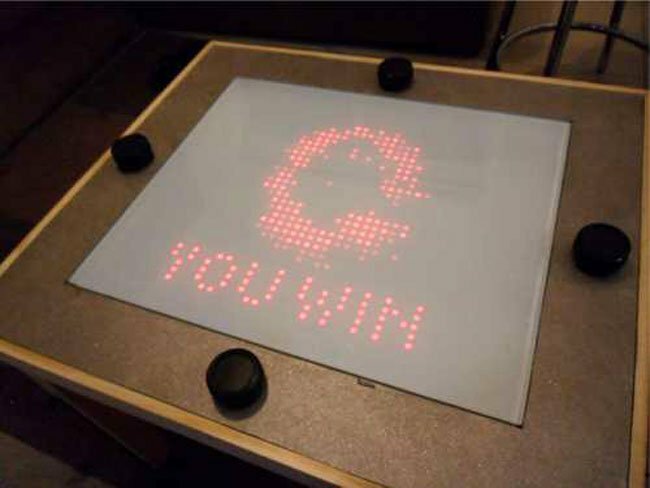 no doubt you have seen the many variations of the classic game ‘Pong’, well this coffee table takes that game just that little bit further by allowing you to play up to four players at once with 5 balls on the screen at a time. It’s a fast paced – action packed game of mayhem! You can find out full details on how this cool retro Pong coffee table was made over at Instructables.